Virtual reality is a bit of a strange thing. There is nothing “real” about the images you are seeing, rather it is just a fantasy brought to life through your brain, eyes, and a high tech pair of goggles. Of course, what would the point of virtual reality be if it were only used to recreate real life? That sounds boring! Take Bandai Namco’s Summer Lesson Tech Demo for example. 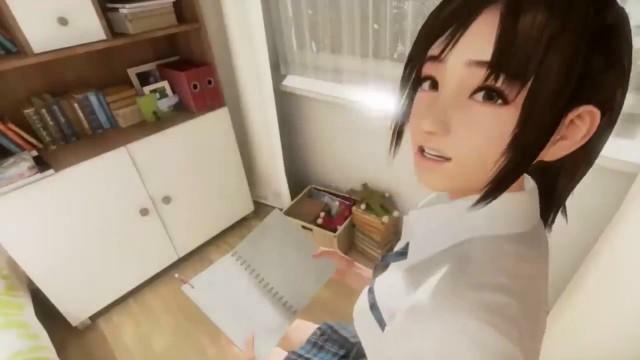 This now infamous software for PlayStation’s Project Morpheus puts you in the place of a tutor hired to give summer lessons to a “Japanese high school girl.” She’s cute, bubbly, wears a ridiculously short skirt and low-cut blouse, and speaks to you using most polite Japanese and respectable mannerisms you can possibly imagine. She is a fantasy for some, and it’s for all the wrong reasons. Why does this bother me so much? Well, there is nothing “real” about this. I teach actual Japanese high school girls on a weekly basis, and this sexualized stereotype hits a little too close to home for me. Some might shrug, say it’s not a big deal, or even naively suggest that there is nothing sexual at all about this tech demo, but I think I’ve found my limit of what is acceptable to me. Of course, who am I to complain about images like these in a Japanese video game? I shrugged off the controversy around Metal Gear Solid V’s lady character, Quiet, and heaped praises on Bayonetta 2, which stars a walking fetish in high heeled boots. I suppose that my line falls somewhere in the rapidly shrinking realm between fantasy and reality. I enjoy Bayonetta because I know that it is a fantasy experience. I have a controller in my hands and a TV screen separating me from the action, and the same goes for Final Fantasy, Persona, and Metal Gear Solid. This, though, is an attempt at recreating “reality,” and it couldn’t be further from the truth. No, real Japanese high school girls do not look and dress like this. They look just like the high school kids you see driving or even taking the bus to school each morning in your American neighborhoods. They have the same social stresses, vulnerabilities, and outlooks on life as the kids down the street from you. I’m not saying that it doesn’t look fantastic. As a virtual reality program, the graphics are amazing, especially her natural body animations, and the head-motion controls are out of this world. It just really creeps me out when thinking about how people are inevitably going to abuse this if they ever get their hands on it. The screenshots below sums it all up quite nicely. No, guys. Virtual reality might be different, but in actual reality, she doesn’t just giggle this off and let you continue teaching her in a secluded bedroom. She screams, runs to get her parents, and they file all the proper charges against you. I really hope Bandai Namco programmed in some virtual reality police to knock a few heads in and remind mis-users of what happens in actual reality. Maybe they programmed a virtual reality prison in it as well, and a representative from Sony will come staple it into their skulls until their sentence is up. This really seems like something a sleazy doujin company would make and not a major, respectable publisher like Bandai Namco. Even if it is just a tech demo that might never reach the public, it’s time to stop showing this off. I’m shocked that this still exists in any fashion.